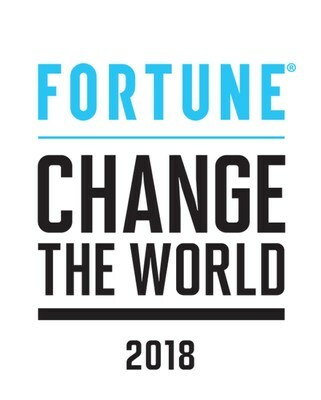 SCHAFFHAUSEN, Switzerland, Aug. 20, 2018 /PRNewswire/ — TE Connectivity Ltd. (NYSE: TEL), a world leader in connectivity and sensor solutions, has been named to Fortune’s 2018 Change the World list. The list recognizes 63 companies that make global social or environmental benefit part of their business strategy. Companies with annual revenues of $1 billion or more are evaluated on four factors: measurable social impact, scale of business results, degree of innovation and level of executive commitment to purpose-driven growth. TE Connectivity was selected for its sustainability impact in working with the world’s largest automakers to enable the transition to cleaner energy vehicles. By providing the technology and engineering required to turn electric vehicle concepts into viable commercial solutions and helping to reduce the emissions of heavy duty industrial and commercial transportation vehicles, TE operates at the epicenter of some of the most exciting technological transformations and long-term global growth trends today. From autonomous and electric vehicles to next generation aircraft, smart factories, high speed data centers and advanced medical devices, TE’s connectors and sensors enable an increasingly electronic and connected world. This is TE’s second recognition from Fortune this year. The company was previously named to Fortune’s 2018 list of the World’s Most Admired Companies. TE has also been named to the Dow Jones Sustainability North America list for six consecutive years and is recognized as one of Ethisphere’s World’s Most Ethical Companies, a Top 100 Global Innovator by Clarivate Analytics, one of China’s 50 Most Innovative Companies by Fast Company China, one of America’s Best Employers by Forbes magazine, and a Best Place to Work for LGBTQ Equality in the U.S. and Mexico by the Human Rights Campaign.